2018 is here and with it comes new home design trends, especially when it comes to colour. Whether you’re looking to revamp your entire home, spice up a single room or simply add a feature wall, this year’s trending colours are bold and exciting. 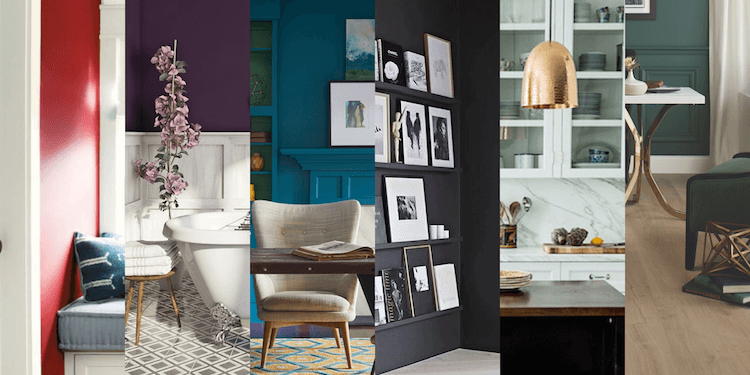 The top trends for 2018 will bring a shift from neutral colour palettes to deep, rich colours. We’ll see striking jewel tones and deep metallics that bring and sense of luxury and elegance to any room. With 2017 done and gone, it seemed that everyone was a little extra excited for 2018. From technology to beauty to lifestyle, this year is sure to be filled with innovation and interior decor is no exception. Themes such as minimalism, self-care and even a little bit of a 70’s and 80’s revival will influence our homes and lives in the months to come. The Benjamin Moore colour of the year is strong, radiant and full of energy. Caliente isn’t for the faint of heart, but those bold enough to add this splash of colour to their home won’t be disappointed. You won’t be able to resist the bold strokes of this colour. Many will find this rich crimson red intimidating but it will add spice (and a little heat) to any room. It can make a powerful first impression on a front door or add life to a book-lined library. While it might be too much for an entire room, a bright feature wall has the ability to completely transform a space. Each year, designers from all backgrounds anxiously await the release of Pantone’s colour of the year, and 2018 definitely didn’t disappoint. A dramatically provocative and thoughtful purple shade, PANTONE 18-3838 Ultra Violet communicates originality, ingenuity, and visionary thinking that points us toward the future. 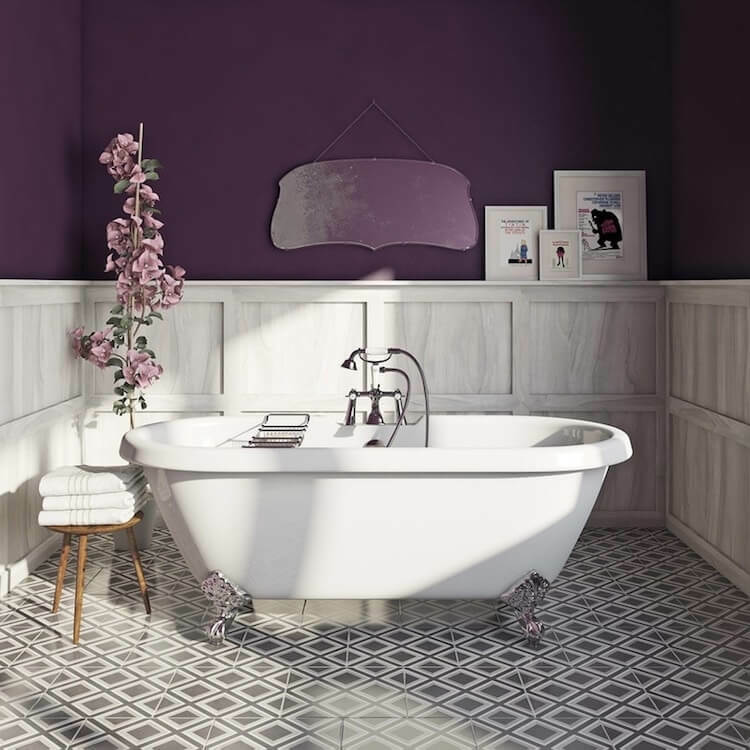 Enigmatic purple is often associated with mindfulness practices, which offer a higher ground to those seeking refuge from today’s over-stimulated world making it an excellent choice for meditation spaces, or to create a relaxing spa-like atmosphere in the bathroom. Ultra Violet is nuanced and full of emotion making it the perfect colour for a room that inspires and invigorates. 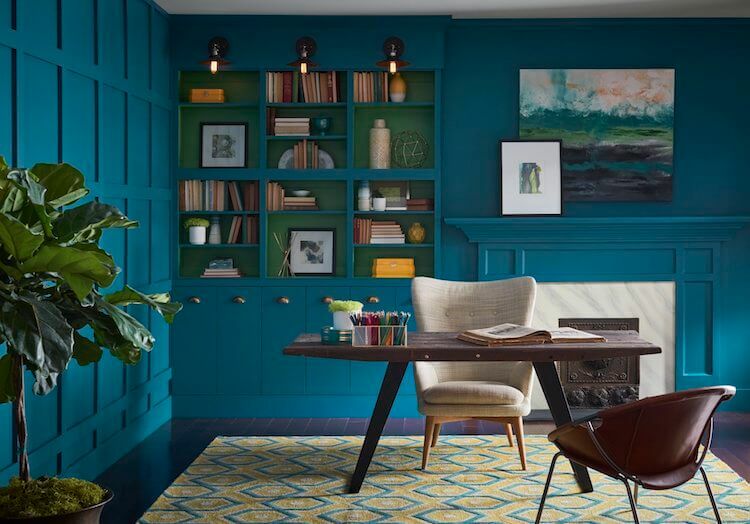 A collision of rich blue with jewel-toned green, a colour that is both accessible and elusive, Sherwin Williams colour of the year is Oceanside. Blue is the most beloved colour worldwide and this multi-dimensional, marine-inspired colour proves why. Oceanside creates a welcoming statement that is great for boosting creative thinking and clarity of thought in a home office. A complex, deep colour that offers a sense of the familiar with a hint of the unknown, Oceanside bridges together a harmonious balance of blues and greens that can be found in what’s old and new. Glidden Paints isn’t holding back for 2018 crowning Deep Onyx as its colour of the year. Black is easier to use than you might think as it encourages a “less is more” approach to décor. Just like a little black dress, Deep Onyx has a place in every home. 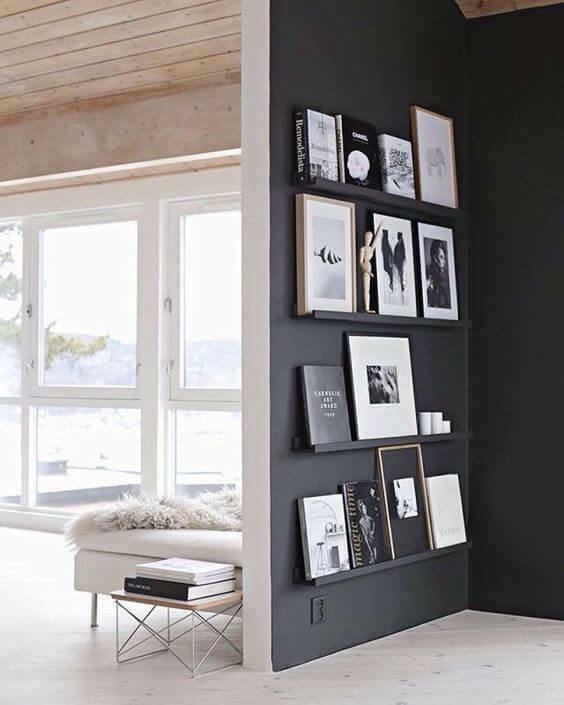 Black is often overlooked as a neutral colour, but it works well on an accent wall or as an alternative to white paint on doors, trim and cabinets. And don’t even get us started on how easy it is to keep looking clean. Try Deep Onyx with basics like primary reds and blues, white, and earthy browns and greens. Move over copper, it’s time for bronze to shine. For 2018, there’s nothing quite as striking and versatile as metallics. From wallpapers, fabrics, furniture and decorative details, gold, brass, silver, bronze, and rose gold are here to stay. They also happen to complement the bold colour tones above perfectly. 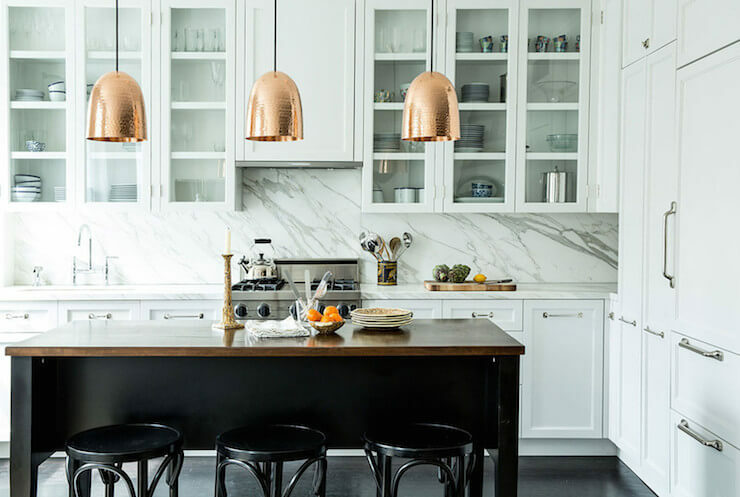 Use metallics sparingly as a compliment to objects with little to no sheen. Metallics are also great for mixing and matching. Choose a metal you love to be the most prominent in your space, then select one or two metal accents to complete the look. Your walls aren’t the only thing that these bold colour trends affect. While there really are no wrong colour combinations when it comes to wood floors and bold walls, there are textures and colours and complement one another best. 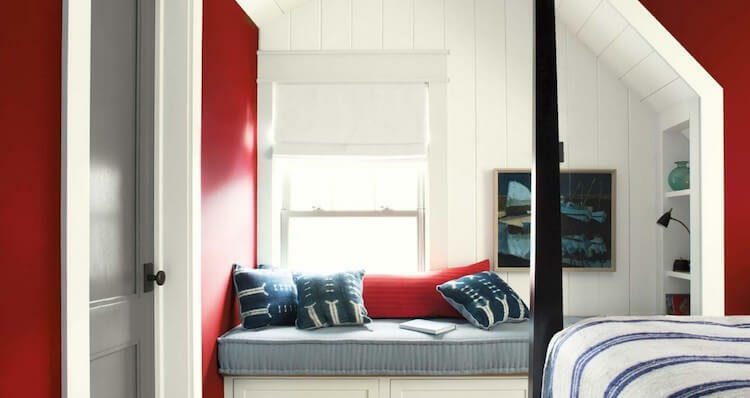 A saturated colour like a bold red such as Caliente or rich teal blue like Oceanside looks best when paired with natural wood tones. Because of this, we’re predicting the return of true blonde wood stains. Pair your new Caliente or Oceanside walls with our SuperSolid 7 Hardwood in Wildwood Oak or CorkWood Designer in Morningside Oak to bring this look to life. Metallics really pop when combined with sophisticated grey stains. 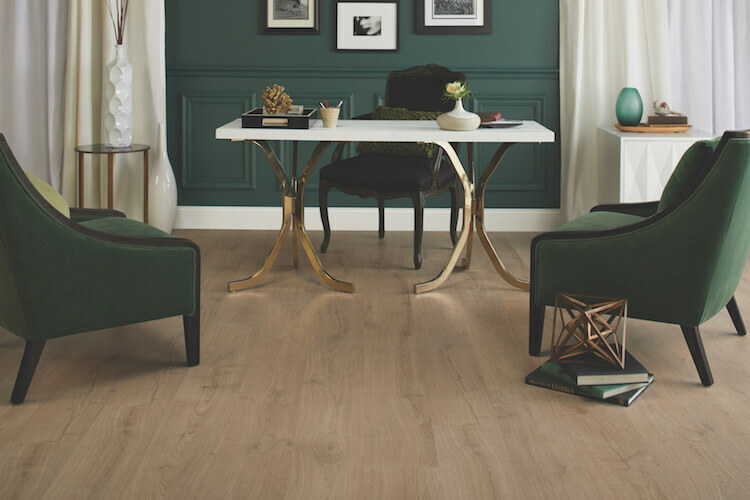 Coming later this year is EverWood Premier in Shelbourne, a new shade that will look perfect with metallic accents. 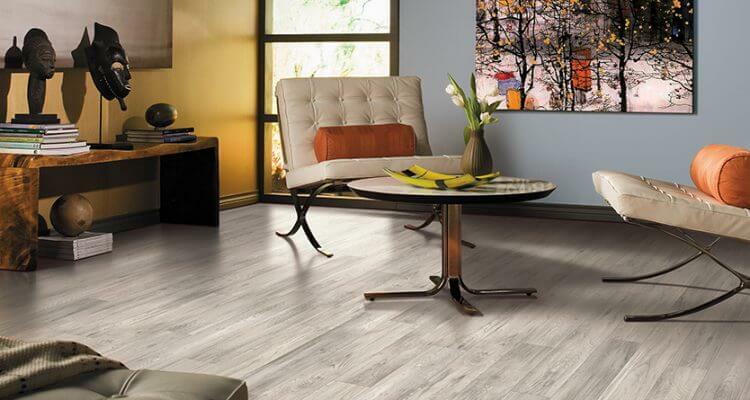 They also look perfect with deep jewel tones on the wall and a floor like our Largo laminate in Shaker Oak! If you’re brave enough to try Deep Onyx, lighter wood tones create a dramatic and sophisticated contrast. We think that TORLYS Elka 12mm laminate floors in Toasted Oak would look perfect with Deep Onyx on your walls. Many (if not all) of these trending colours might seem intimidating, but as with most decorating trends, moderation is key. Try starting with a feature wall or accent pieces. We also suggest you try it before you buy it. Most paint suppliers have online apps that allow you to upload a photo of your room and apply a colour. This allows you to see the colour in your space before you even purchase it. 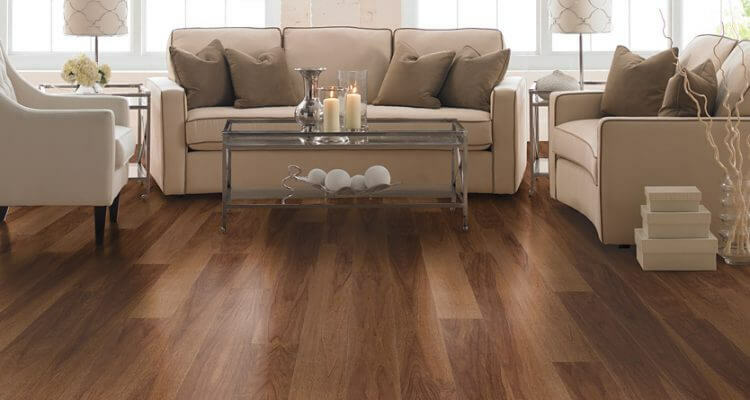 Would you like to see TORLYS floors in your home before purchasing? Use our flooring visualizer tool to get a sense of what your home will look like with new floors in it. Find your nearest TORLYS dealer and talk to them your overall design vision. They’ll be able to help you pick the right flooring material and help ensure your floors, accents, and walls all work together.